Fall is right around the corner, but my gardens are lush thanks to an unusually wet August. 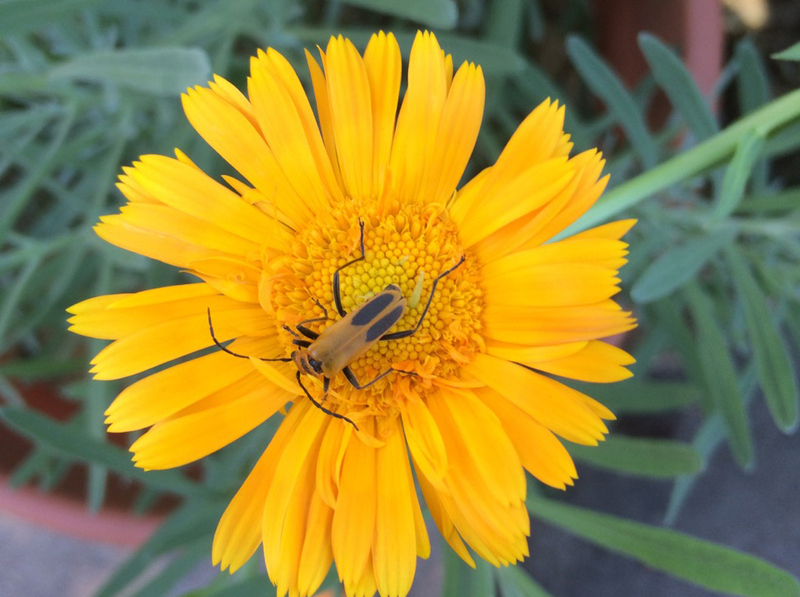 Soldier beetle—a beneficial insect that preys on aphids. I usually see these on orange or yellow flowers, an excellent choice for camouflage. After a very slow start, we’ve now released more monarchs this year than we did in 2015—the current count is 20. They are so tiny when they first hatch! 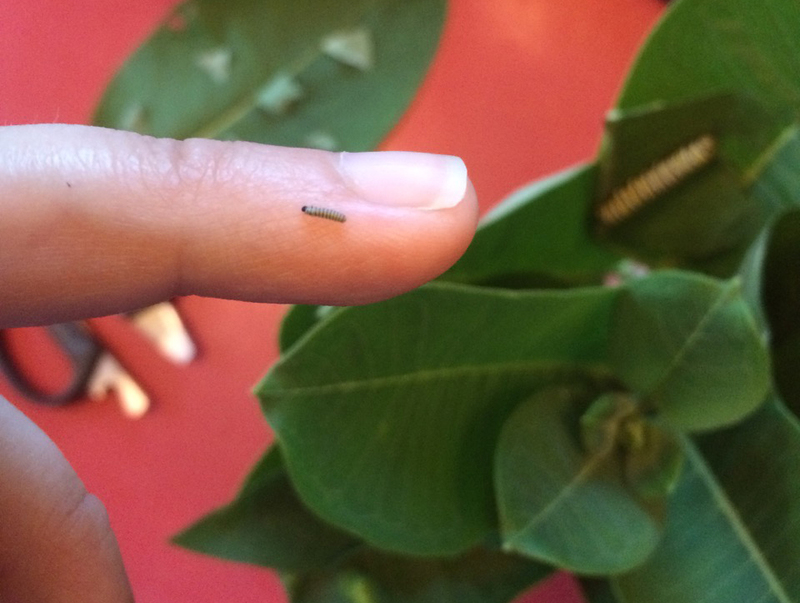 We also raised three black swallowtail butterfly caterpillars, but unfortunately one of them hatched out of its chrysalis with a deformed wing. We ended up mercy-killing it and will donate its body to the STEM classroom at school. Pictured: one of the lucky two that came out perfectly. 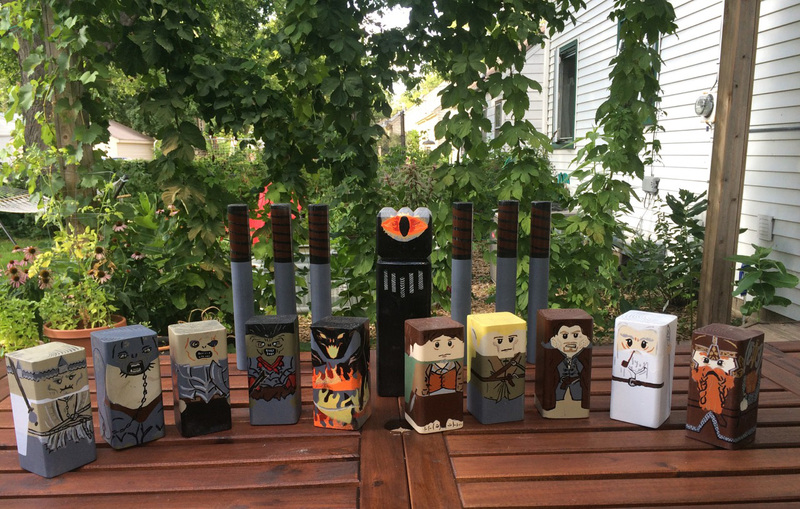 Adam and the kids made a Lord of the Rings-themed kubb set for our family a few weeks ago. With three artists and two months off school, the arts and crafts production reaches a fever pitch during the summer. 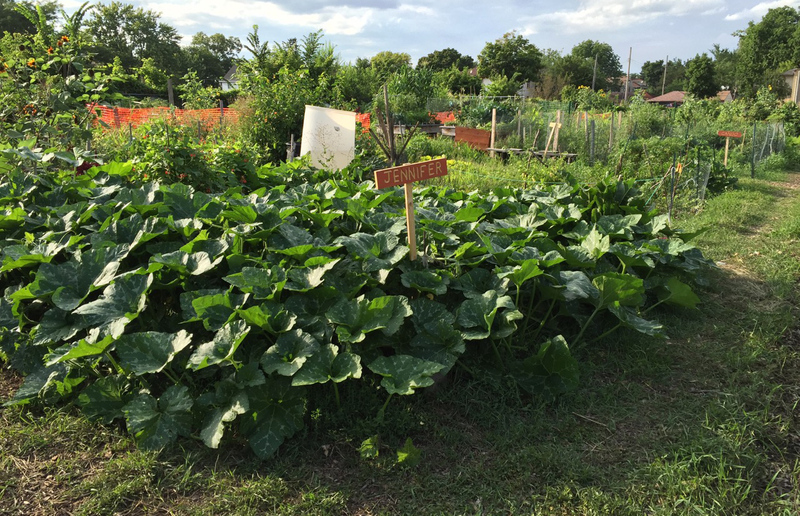 I received an email from our community garden coordinator yesterday mentioning that my pumpkins are now blocking the paths on both sides of my plot. Oops! Going to cut them back later today. These are Musquee de Provence pumpkins; they started slowly but have quadrupled in size the past four weeks. We’ve been harvesting potatoes for over a month now. Instead of buying seed potatoes this year, I simply cut up some old sprouty potatoes we had on hand from the co-op. 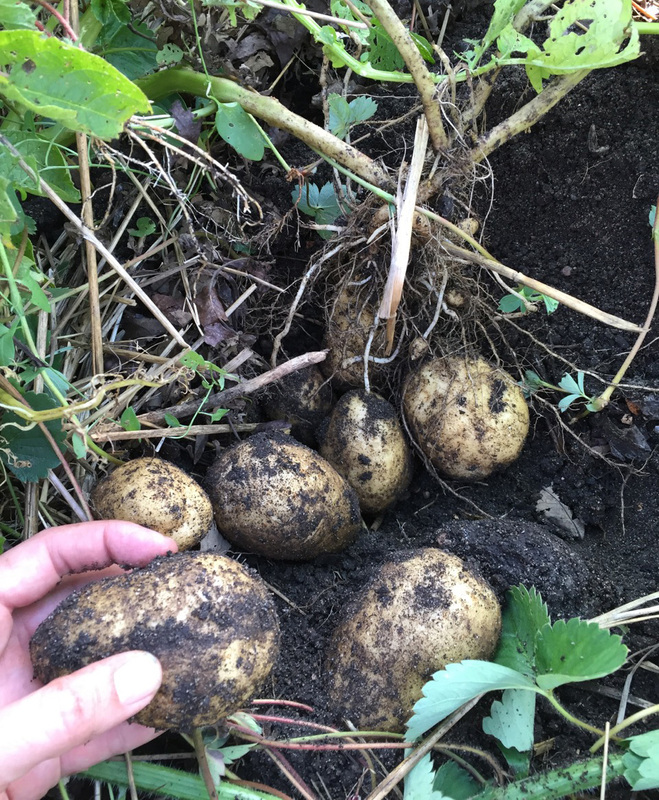 Result: our best potato harvest yet. 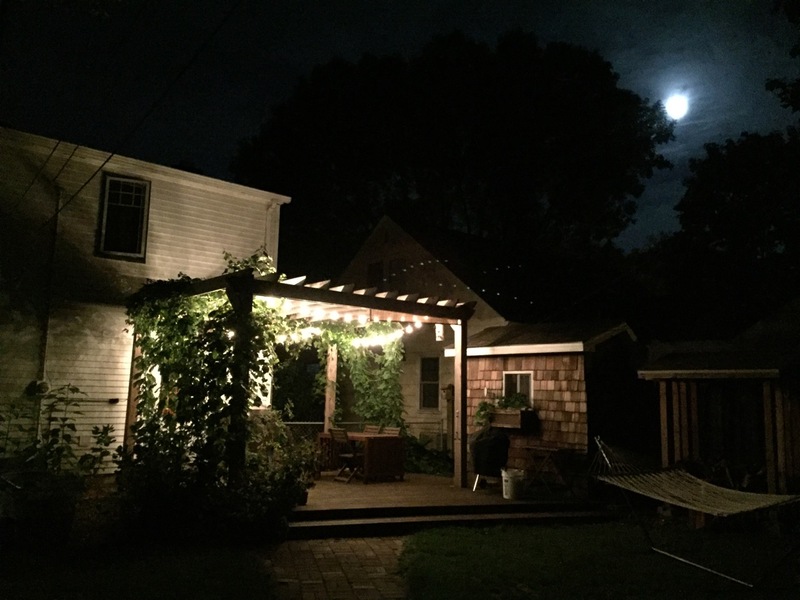 By this time next year, my deck arbor should look how I originally envisioned it: covered in vines, cool and shady even during the middle of the day. This is only year two, so I’m pleased with how far it’s come along. These rudbeckia laciniatas (green-headed coneflower) were taking over my boulevard in 2015. At 6+ feet tall, they were way too big for that spot—and spreading fast. We transplanted all of them to family hunting land this spring and most of them survived! They look much better in their natural meadow environment. That meadow is also full of goldenrod. 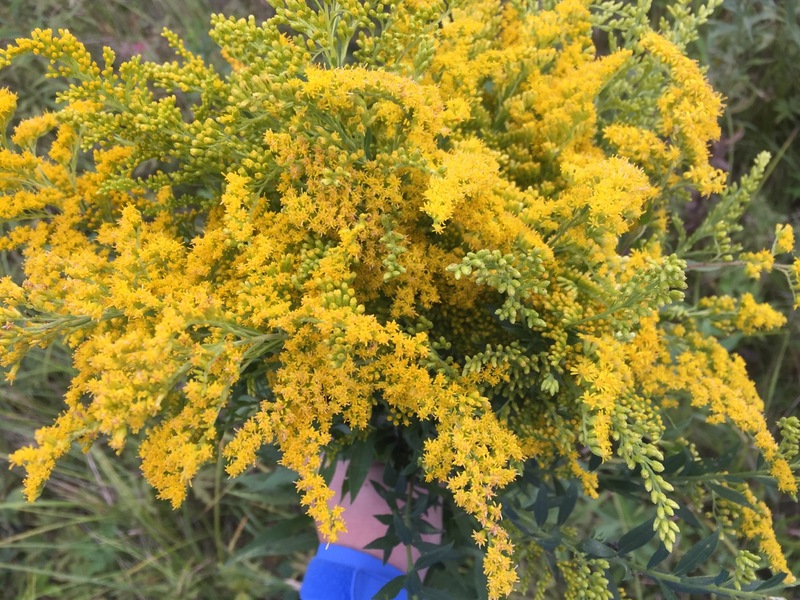 I picked a nice large bunch to dry for tea this winter; apparently goldenrod tea is full of health benefits. I’ve never tried it—I will report back on both flavor and miraculous changes to my well-being. I tried lavender again this year, in a pot on my steps. It’s grown quite a bit but it just… will… not… bloom. It’s running out of time, too. 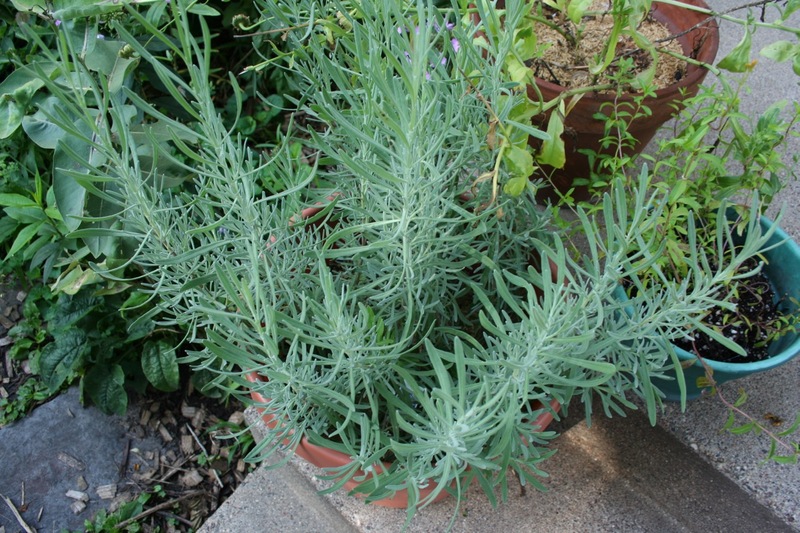 Lavender: I have never successfully grown it. I’m thinking this is a sun issue—very few areas in my home yard are very sunny. I may try it at my extremely sunny community garden plot next year. 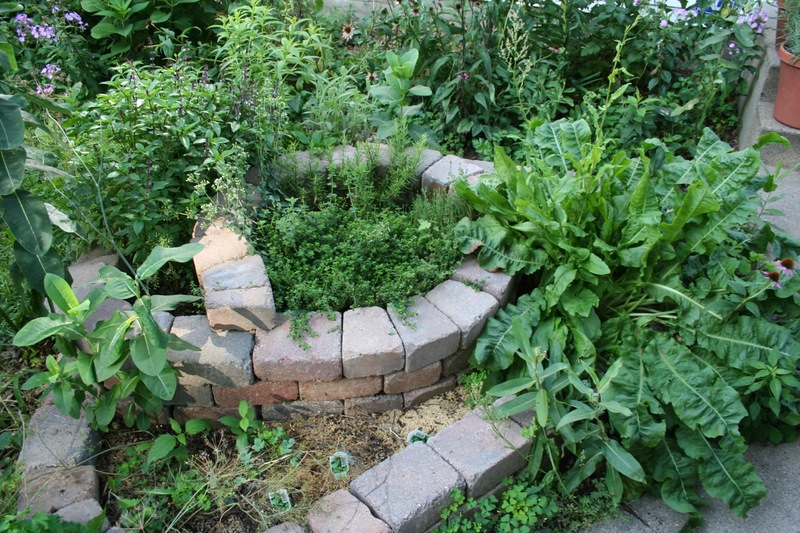 My herb spiral, in its overgrown end-of-summer state. The sorrel (right) really took off, to the point where we don’t use nearly enough of it to keep up. I like the flavor of it, but no one else in the family does so it’s not getting much use. 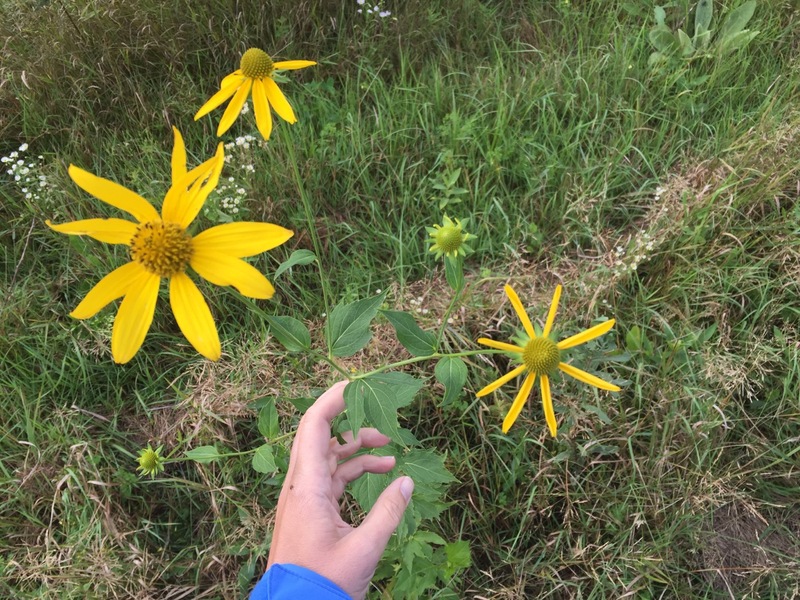 A former co-worker divided many of her brown-eyed susan plants mid-summer last year and gave me several. They are thriving. 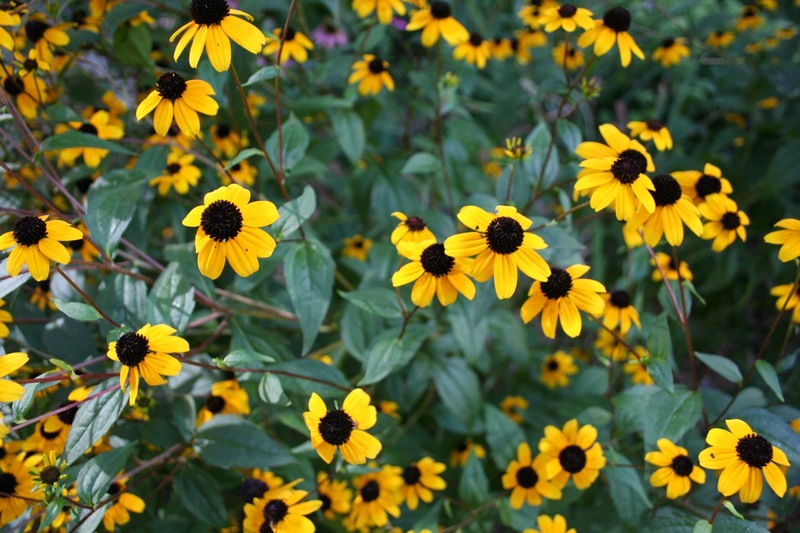 In general, brown-eyed susan plants are easy to grow but individual plants are relatively short-lived, so it pays to let them spread a little by seed. Same goes for purple coneflowers. This is one of MANY reasons why organic materials are the only mulch to choose if you’re going to plant natives. Put them in, mulch them with old leaves or woodchips, then let them spread and move around a little bit. You’ll be rewarded with volunteers to share with family and friends and spread around your own garden. It’s much more difficult to do that with plastic or rock mulch—you’re tied to the very first placement of the plant, and forced to replace it entirely when it dies. This used to be a garden path! Now it is an overgrown zucchini plant. Aah, August. 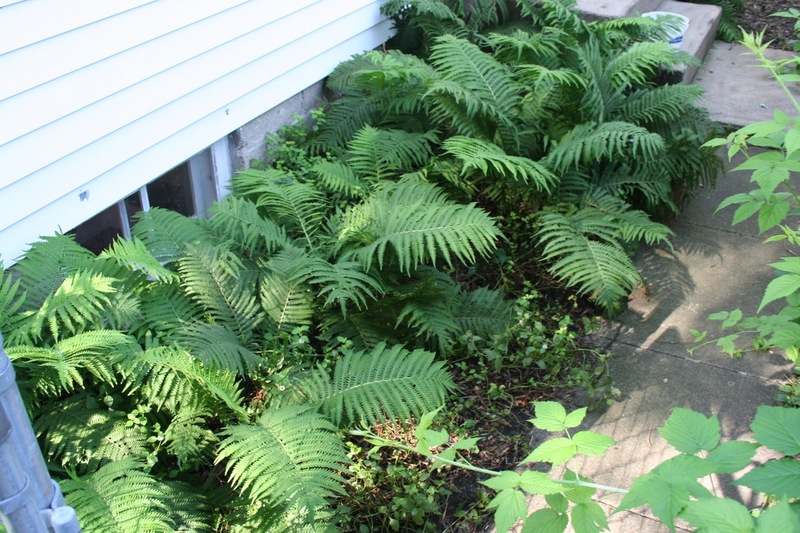 Ostrich ferns and chocolate mint have been waging war on each other for several years in this north-side foundation planting. It’s a pretty contained spot—there’s only one direction for them to escape and it’s narrow (to the east/left side of the photo). The mint started so strong that I was afraid it would completely eradicate the ostrich ferns, but this year thanks to plentiful rain, the ostrich ferns really took off. Will 2017 be the year I FINALLY have enough fiddleheads to actually harvest and cook some? We’ll see. August is also officially the season of the big bugs, especially given our tropical weather. Out in the country, literal clouds of mosquitoes are helping to create literal clouds of dragonflies. 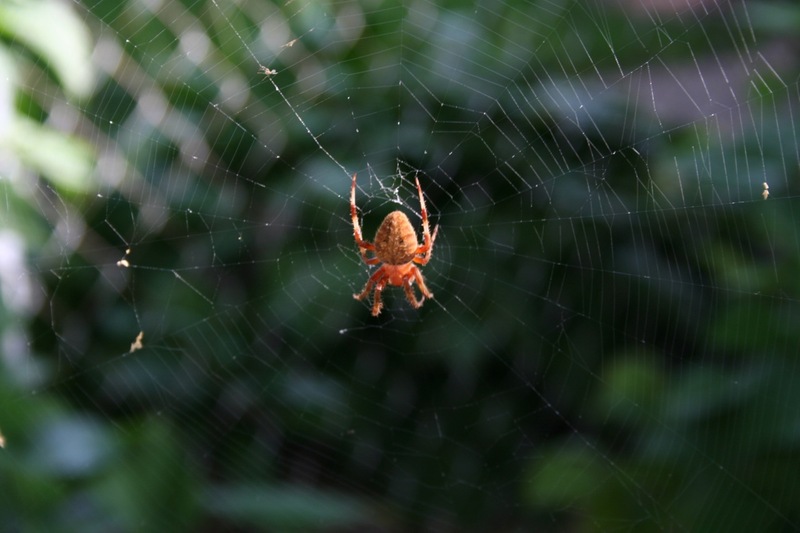 This spider built a web between our fence and our nannyberry. 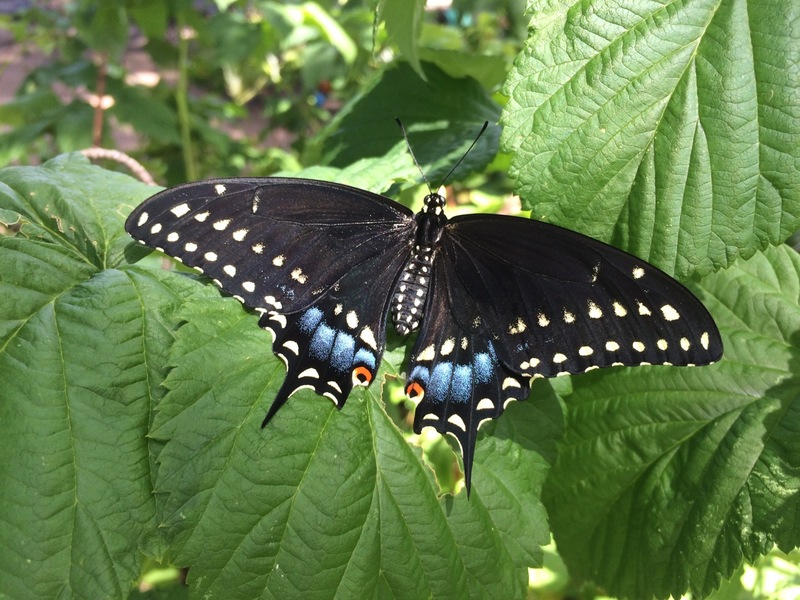 By the end of summer, the prey-predator balance in the insect world of my yard means I worry more about saving butterfly caterpillars than eliminating aphids or cabbage worms. I’m all for edible landscaping, but mixing in as many natives as possible creates habitat that brings your yard to life. And it is amazing. 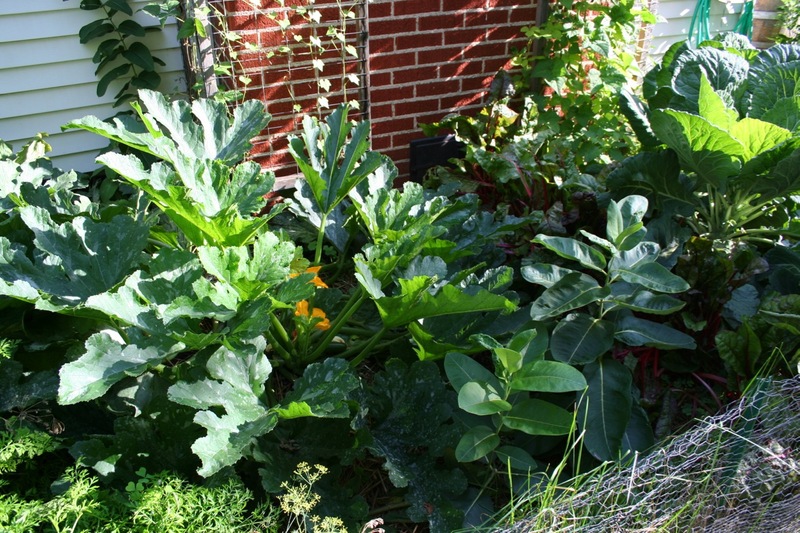 Categories: Gardening, Permaculture, Practical | Tags: edible landscaping, Permaculture, pumpkin, zucchini | Permalink.